Placed just in from the earthquake (2009) created edge. Thanks to Ed Carr for making the domes for me. Coral reef health is rapidly declining, globally. Pollution, over-fishing, sedimentation and other local human impacts contribute, but global warming is the most serious long-term threat to corals. Elevated sea temperatures have caused wide spread bleaching and disease outbreaks contributing to massive mortality. In 2006 the Caribbean acroporids (Elkhorn and Staghorn) were the first corals to be listed on the IUCN Red List; their status is Critically Endangered, one step away from extinct in the wild. These corals formally were the most common in the Caribbean but their abundance has declined by >98% in the last 30 years. The good news is that these corals, Acropora palmata, A. cervicornis, and their ecologically significant hybrid, A. prolifera are the fastest-growing of all tropical Atlantic reef building species and they naturally reproduce asexually by fragmentation. Because they have adapted to high wave action and storms, broken fragments can create new colonies if they are stabilized. 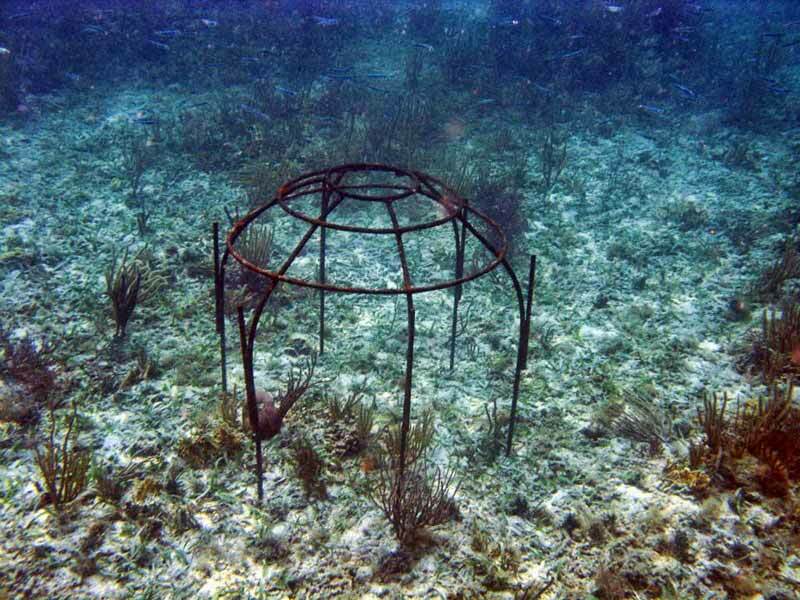 Reef restoration projects in Belize since 2006 have taken advantage of this by affixing loose fragments back to the reef with either cement and/or cable ties after storms or ship groundings have broken up corals. In Mexico this technique was used after Hurricanes Ivan (2004) and Wilma (2005). 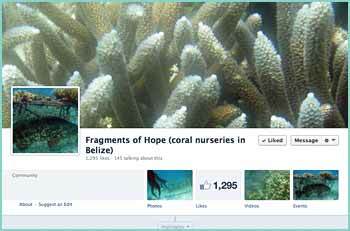 Since 2009 researchers have taken this one step further by establishing multiple (11) coral nurseries in Belize. The focus is on the Acroporidae because of their endangered status and rapid growth rates: they can produce >300% of their original mass in just a year using three different artificial substrates: ropes, metal frames and cement discs on tables. While similar restoration efforts are occurring in places like Honduras, Jamaica, Puerto Rico, the Florida Keys and the Dominica Republic with the aim of re-seeding reefs, only in Belize has the primary focus been on climate change adaptation by identifying corals with the most resistance to bleaching and disease. Both the coral host (animal) and their tiny symbiotic algae clades that live within the coral tissues have been genetically characterized (23 genotypes of corals to date) in an effort to understand why some corals are more resistant and/or resilient to bleaching and disease. 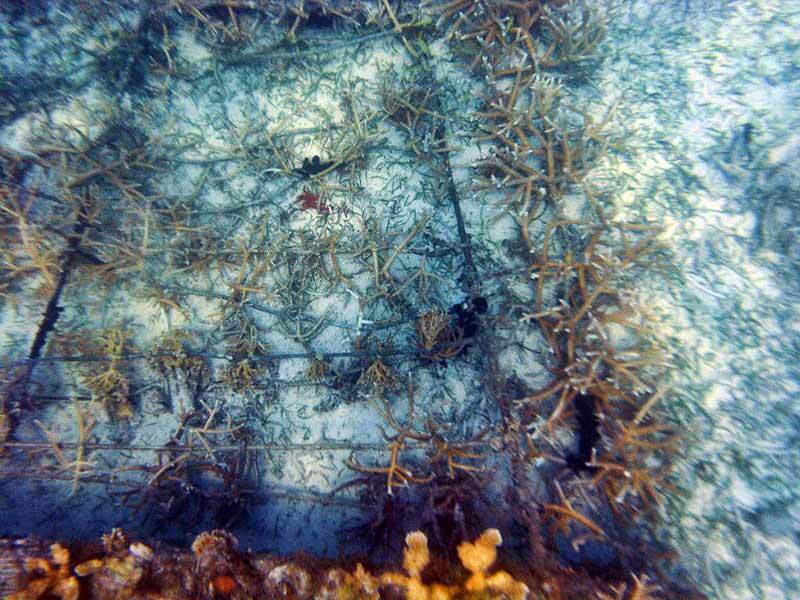 Genetics play a key role in out-planting nursery-reared corals back onto the reef. Corals are animals and can sexually reproduce so it is important to re-seed the reef with diverse genotypes so that they may spawn and begin to recover their former abundance through sexual reproduction and local adaptation as well as with asexually propagated, nursery-reared corals. Laughing Bird Caye National Park in Southern Belize is the first true reef restoration site. It was chosen because it has complete protection (no fishing allowed) and this is crucial to maintaining a healthy ecosystem. In areas where lobsters have been over-fished, for example, there are too many coral-eating snails that attack new corals; predation on corals is elevated when there are fewer corals and no predators to keep the snails in check. Laughing Bird Caye National Park is also part of the Belize Barrier Reef System World Heritage Site and receives over 10,000 visitors a year making it an international as well as local treasure. To date over 2000 coral fragments have been planted at Laughing Bird Caye National Park (~200m2) with the support of local tour guides, the Belize Fisheries Department and local NGO’s. The plan is to at least double the amount of corals planted each year, as the “mother” corals in the nurseries continue to grow after each trimming/out-planting. True reef restoration includes more than just the Acroporids so eight other coral species are included in the nurseries for future out-planting, some of them much slower growers. Currently some researchers are lobbying to include another 12 Caribbean coral species on the IUCN Red List so the time is now to experiment with growing and re-planting these corals. In the current climate of doom and gloom for reefs, growing and replanting corals represents a hands-on adaptive strategy for stakeholders like marine tour guides, marine reserve staff and in the near future, trained volunteers. In Belize we are taking steps to ensure that we are propagating not only multiple genotypes, but also the strongest, fittest ones, too. This project has received funding from the World Bank, the Caribbean Community Climate Change Centre, World Wildlife Fund, PACT, Project AWARE and Healthy Reefs for Healthy People Initiative. Local marine biologist Lisa Carne is the manager and facilitator of the Belize work, assisted by Dr. Austin Bowden-Kerby, who pioneered many of the coral nursery methods. Collaboration and sharing of lessons learned among researchers throughout the Caribbean is at a high level, and lessons learned in Belize have already been used to improve the work in the Dominican Republic, Puerto Rico, and Jamaica, with lessons from these other countries being used in the Belize program. A handbook is being drafted as part of the ongoing collaboration, in order to encourage others to join in this promising work.